TechnoFILE - When is Widescreen Not Widescreen? It pays to read the fine print, even on DVD packages. When I upgraded to a widescreen TV, I anticipated a wonderful metamorphosis as my DVD collection magically changed into awe-inspiring widescreen visions instead of being merely "letterboxed." For the most part this has proved to be the case. Unfortunately, it isn't always so, so if you're interested in truly widescreen DVD's you may want to rent before buying them to ensure you're getting that for which you're paying. Widescreen TV's are wonderful because the new screen shape (a rectangular 16x9 as opposed to the relatively square 4x3 with which we all grew up) means those widescreen DVD movies that you had to watch "letterboxed" (with black bars above and below the widescreen picture) can now be seen in their true full screen glory. Even really wide movies, those with aspect ratios of 2.35:1 or more, almost fill the whole widescreen TV from top to bottom, leaving only small (and completely acceptable) black unused areas where, on 4x3 screens, there'd be a half screen's worth of unused darkness. This really brings the concept of "home theater" to life, and makes you wonder why you'd ever consider going to the local movieplex again! Take "Titanic," for example. James Cameron's epic cries out to be watched on the biggest, most state-of-the-art TV you can find! The THX-certified (a standard designed to ensure the best possible audio and video quality) DVD even says on the front of the box that it's part of Paramount's "Widescreen Collection." So far so good. On my old Sony XBR, "Titanic" looked as good as you'd expect from a THX-certified DVD. When I brought it up on my widescreen TV, however, I was horrified to find that the DVD wasn't really released in a true widescreen format at all! What appeared on my screen was a picture that was both "keyholed" and "letterboxed." This means there were bars on each side of the screen ("keyholing" - my term for unused areas between the edges of the 16x9 screen and the 4x3 picture in the middle - kind of "letterboxing flipped on its side") as well as bars above and below the movie itself ("letterboxing" - the areas at the top and bottom of 4x3 aspect ratio TV's screen that aren't used by the rectangular movie). Confused? It means the DVD actually yielded a usable picture about the same size as I'd gotten from my old 4x3 TV! What a waste of technology - and money! Then I began discovering other DVD's had the same problem, including one that, as far as I'm concerned, is a clear case of false advertising. I received an old copy of "2010" for Christmas and it's labeled on the box as "enhanced for widescreen TV's." 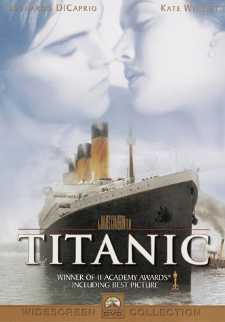 Regardless of that, however, the disc suffers from the same problem as "Titanic." So does Disney's "The Little Mermaid." There are plenty more. Universal's "Collector's Edition" DVD of "Somewhere in Time" gets it partly right but, alas, it's the wrong part. The menus fill the 16x9 screen perfectly, but when you press "Play" the picture shrinks to that darn little window again. Some, if not most, widescreen TV's offer a "zoom" feature that lets you expand the picture to fill your 16x9 screen, but it isn't as sharp and clean as a DVD should be. It's a patchwork solution, and though it's better than nothing, it isn't particularly satisfying. Interestingly, "A Bug's Life" (which purports to offer "full screen" - cropped to 4x3 - and "widescreen" on the same disc) and Fox's "True Lies" automatically kick my TV into "zoom" mode, which merely hides the problem. Whether a DVD is really in widescreen can usually (but, as witnessed by "2010," not always) be foretold on the box. Paramount and Disney now label widescreen discs as "enhanced for 16x9 TV's," while Columbia Tristar, Universal, and Fox DVD's use the term "anamorphic widescreen" to mean the same thing. So if you're building a DVD collection with an eye to the future (and shouldn't we all? ), keep this problem in mind, lest you find your investment in high tech discs becomes obsolete the minute you go widescreen yourself. Jim Bray's technology columns are distributed by the TechnoFILE Syndicate. Copyright Jim Bray.